The fog was still coming in off coast, as it does most mornings in the summer and we had finished with breakfast. There were dirty dishes in the wash-basin, resting on the wooden counter next to the camp stove. They would remain dirty until someone drove to the spring-box on the side of Comptche-Ukiah Road to fetch a few containers of water. Someone, one of the teenagers perhaps, mumbled "There must be a way to get water around here without driving seven miles up the road to the spring and back." It is almost impossible to explain the reason why trees in the pygmy forest are stunted without explaining the hardpan. Hardpan is an iron-laced and sand, concrete-like soil layer that forms a few feet under ground level. It is so tough that it cannot be penetrated by tree roots and so dense that it is impermeable to water. It is reddish in color and has the feel of sandpaper. The pygmy forest only grows over a soil covered hardpan layer. The water table under the pygmy forest fluctuates considerably during the course of a year, sixteen feet underground at the end of summer, up to five feet from the surface in the winter. There are actually two water tables during the rainy season because there is a concrete-like layer of earth a few feet underground that blocks the passage of water and causes a double boiler effect. As a result, a shallow pond at the surface perches above an underground lake. As water pools up on the surface of the pygmy forest, and the dead pine needles and leaves begin to soak in it, the hardpan becomes a sauce pan of sorts, filled with extremely acidic, humus tea. This surface water slowly drains off of the sides of the hardpan and into the underground aquifer, taking most of it's nutrients with it. When we bought the property the realtor told us that the underground water table was only five feet down in June, and that people in this area used to dig their own wells by hand. With one adult man and four teenage boys in camp, we thought that we could easily dig a five foot deep hole in no time. We had dug the outhouse hole in an afternoon, and it was three feet deep. It was assumed by all that we could start dipping our own water by the bucket-full by tomorrow night if we started digging right now. So we grabbed up a couple of shovels, a mattock, and we started digging. 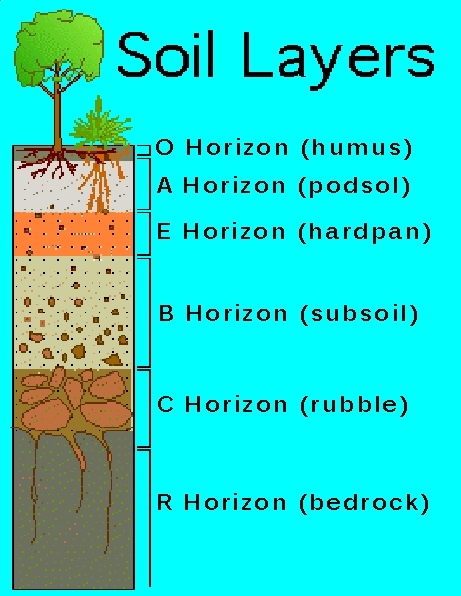 The soil under our feet develops in layers. 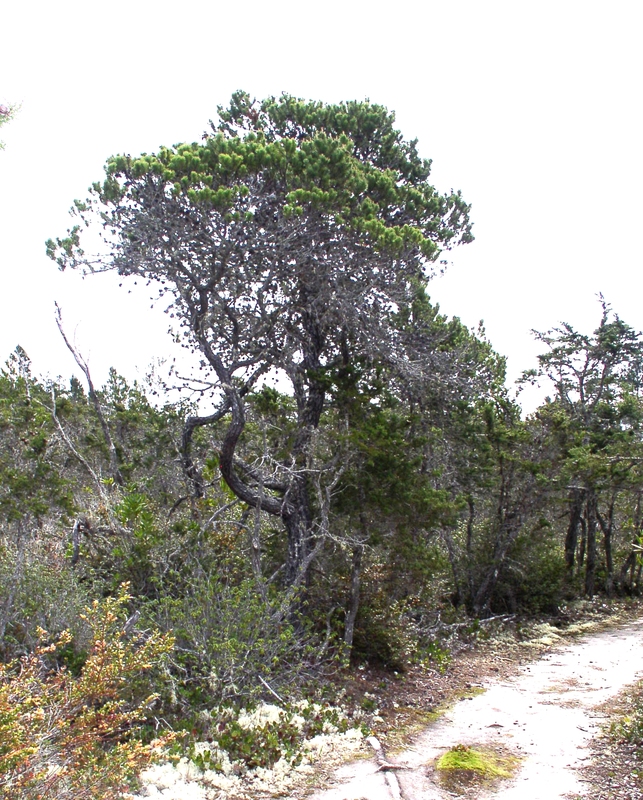 Pygmy forest grows on Blacklock soil, a particular series of layers, or soil horizons that has developed over time. The first or "O" horizon is usually the spent leaf, flower and other loose plant debris that has dropped to the ground and is in the process of decomposing. "O" stands for organic. In the pygmy forest the "O" horizon is only a few centimeters thick or non existent. Beneath this is a topsoil zone named the "A" horizon and this is usually a rich, young layer of soil where the composting humus from the "O" horizon mixes with the minerals from below. The "A" horizon is where roots grow to consume available nutrients, water and minerals. In the pygmy forest however, this horizon, up to three feet thick, is soil in which minerals have dissolved and been washed away by seasonal rains over thousands of years. It is always light grey, almost white and consists of sand mostly, with a measure of clay. This type of nutrient poor, acidic, bleached soil is called podsol. It has the texture and density of chalk or plaster. As we continued to dig, the soil changed texture and color. At about two feet it got much easier to dig and the soil became slightly orange. There were reddish pebbles mixed with it which became larger and more numerous as we dug down. We made rapid progress for a second day but had to break up some large, mottled-red, sandy rocks to get them out of the way. Digging the podsol is tough work because it is too hard to stick a shovel in. It must be attacked with a mattock to break fist-sized chunks loose, to be shoveled out and hauled away in a wheelbarrow. With lots of people trading off often, progress was steady and by the end of the day we had a hole four feet in diameter (much larger than an outhouse hole) and over two feet deep. We had high hopes of hitting water tomorrow. Podsol is a soil that develops under conditions of heavy rainfall, over many years that creates a high rate of leaching out minerals. Moisture moves down through the surface zone, and chemical elements such as calcium, sodium, potassium and iron are dissolved and carried downward in solution. Ultra-fine clay particles, in a state resembling suspension, also filter through the surface zone. After several centuries a nutrient poor, ashy-grey or white soil develops several inches below humus layer. This is called "podsol" (Russian podsol, "ash soil"). Everything that is leached out of the soil accumulates in the next horizon below ("E" Horizon), which slowly consolidates into hardpan. Podsol is common in areas of heavy rainfall, occurring typically under temperate coniferous woodland. Early on the third day, at just above three feet, downward progress halted as we bottomed out on what appeared to be red sandstone. It was as hard as concrete and the mattock bounced off of it as if it were a brick wall. According to modern pedologic (soil science) theory the acid tolerant pines, cypresses and ericaceous (heather related) shrubs, such as huckleberry and manzanita synthesize organic chelates that, upon reaching the soil, mobilize its inorganic iron and thereby bleach the surface soil. 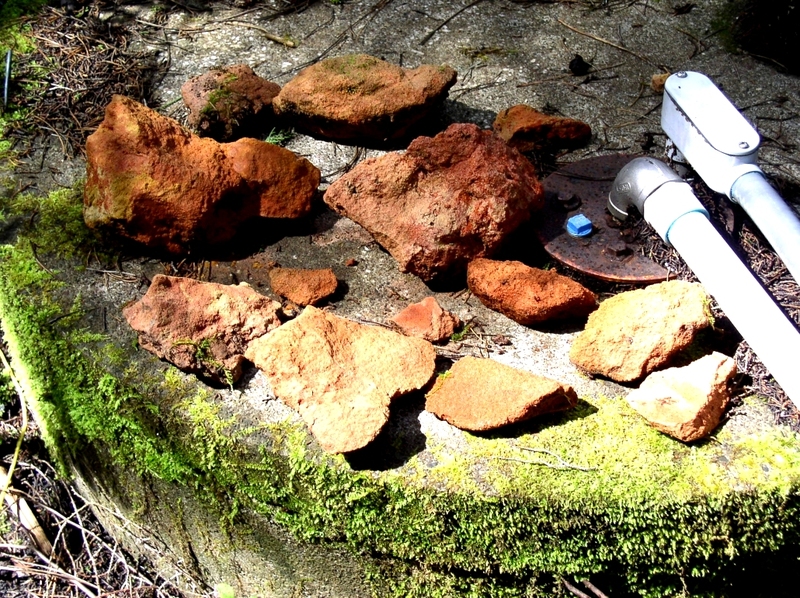 In the subsoil the released iron saturated solution, as positively charged iron hydroxide, cements with the negatively charged quartz sand to form an indurated hardpan. We went to the local Rent-All to get some better, stronger tools, including a digging bar (which we called a pike) and a pick. The pike was a homemade affair made from a 6 foot long by 1-1/4 inch diameter iron pole with one end filed to a point and the other forged into a chisel. This was used by holding onto the center of the shaft with both hands at belly level, lifting it up then driving it straight into the ground with as much force as possible. At each strike, a small divot would fly loose from the hardpan leaving a slight depression. My mother and older brother continued to drive the 14 miles to the spring and back, to fill up water cans every day for the next two weeks and then, every three days, three miles into town to buy enough antiseptic and band aids to clean and cover five pairs of badly blistered hands and 50 blistered fingers. 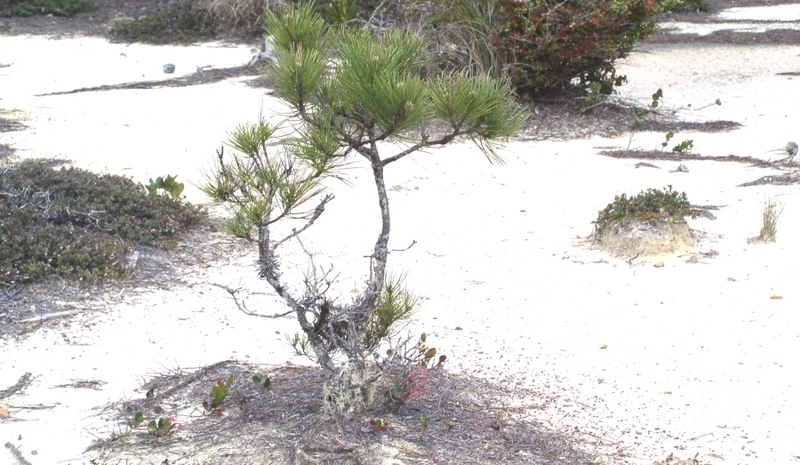 The occassional Bishop pine tree manages to penetrate the hardpan and send it's roots into the nutrient rich subsoil. Such trees can be seen in the pygmy forest towering 40 or 50 feet above the stunted plants below. By the end of day four our hole was about 30 inches deep with a coffee-can sized hole chipped into the bottom. The work of chipping and slamming and banging away at the hardpan went on for the next ten days. We found water a few hours after the thirty-two inch thick hardpan layer had been breached at about five-and-a-half feet and after that we dug and pumped water, sand and gravel out of the hole for a few more days as we sent twenty-three, foot tall, concrete well-rings into the hole to line the new well. Water had never tasted so good as on that day. A "Rediscovering Charlotte M. Hoak Pygmy Forest" event is set to take place on September 10, 2016.